How To Crochet A Fortnite C2C Graphgan – Our Fortnite Ace Emote Crochet patterns contain our Week 12 graph for the graphgan crochet blanket based on the popular Fortnite game. We’re excited for Week 12 of our Fortnite free C2C CAL crochet pattern! We’ve worked hard to design a project you will love! This week contains the chart for the Ace emote. 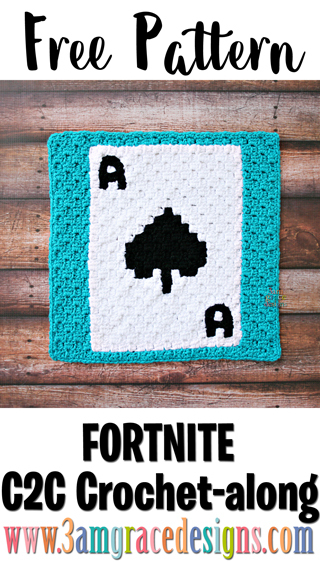 This is one piece to our Fortnite C2C crochet pattern & tutorial for creating a game inspired graphgan blanket. 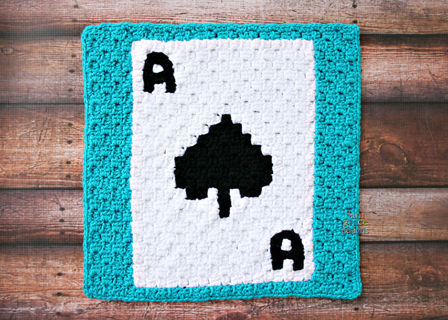 Our Ace Emote panel is made using Hobby Lobby ‘I Love This Yarn’ in Peacock, White, & Black. Download the Ace written instructions. Line 37 on the written instructions has a mistake. Thanks so much for letting us know! Our volunteer corrected it and it’s been uploaded.